(AP) UNITED NATIONS - Armed men ambushed and killed seven U.N. peacekeepers trying to protect villagers in Ivory Coast on Friday and more than 40 of their colleagues who stayed to guard from more attacks remain in danger, the United Nations said. Hundreds of villagers were fleeing the area near the Liberian border, and U.N. officials said others may have been killed or injured. Authorities have been unable to confirm any additional casualties because of the remoteness of the area near the Liberian border. U.N. Secretary-General Ban Ki-moon condemned the attack "in the strongest possible terms," saying he was "saddened and outraged" about the deaths of the peacekeepers, all from Niger. He urged the government of Ivory Coast to identify the perpetrators and bring them to justice. Later on Friday, the U.N. Security Council released a press statement condemning the attack. Ivory Coast's deputy defense minister Paul Koffi Koffi said government forces, along with Liberian and U.N. forces, will launch an operation on June 15 to find the men responsible. He said they were "militia men or mercenaries." Koffi Koffi said they could not respond sooner because it would take time to gather equipment and prepare the forces. An Ivorian Cabinet official who was briefed on the matter said President Alasanne Ouattara requested helicopter gunships from the U.N. and expected them to arrive by Monday. The official spoke on condition of anonymity due to the sensitivity of the matter. Bert Koenders, the U.N. envoy to the west African nation, said the peacekeepers were part of a patrol south of the town of Tai, an area the U.N. mission recently reinforced because of threats of attacks against the civilian population. The ambush involved a large group of armed men, a U.N. official said, speaking on condition of anonymity because he was not authorized to speak publicly. "Their colleagues are still in danger," Ban told reporters. "Even tonight, after the attack, more than 40 peacekeepers remain with the villagers in this remote region to protect them from this armed group." The mayor of Tai, Desire Gnonkonte, told AP that hundreds of villagers were fleeing the area. "We are moving in reinforcements as soon as we have daylight," said Kieran Dwyer, the spokesman for the U.N. peacekeeping department. Josephine Guerrero, a spokeswoman for the U.N.'s Department of Peacekeeping Operations, said it was the biggest attack on peacekeepers in recent years. Sylvie van den Wildenberg, acting spokeswoman for the U.N. mission in Ivory Coast, called it "the first attack of its kind" against U.N. peacekeepers in the country. She said several vehicles were on a reconnaissance patrol near the village of Para on the southern axis of Tai to follow up on "rumors of movement of armed people in the area and threats on the security of civilians." "There were several vehicles on the patrol and the leading vehicles were strongly hit," van den Wildenberg said. "The area is densely forested and very tough terrain." Once a stable nation, the world's largest cocoa producer was split into a rebel-controlled north and government-controlled south after an attempted coup sparked civil war in 2002. A peace deal in March 2007 brought key rebel leaders into the administration and offered hope for a single government after years of foundering accords and disarmament plans. But the country headed to the brink of civil war after a presidential runoff in early 2011 when then-president Laurent Gbagbo refused to concede defeat after losing to Ouattara, the internationally recognized winner of the election. Gbagbo was arrested with the help of U.N. and French forces in April 2011, and is now facing charges of war crimes at The Hague. Ouattara was sworn in as president soon after. Following Gbagbo's arrest, many of the mercenaries and militiamen who fought for him fled across the porous border into Liberia's forests, or clandestinely, into its refugee camps. Western Ivory Coast has remained particularly unstable, and Human Rights Watch said earlier this week that armed groups in Liberia who supported Gbagbo have killed at least 40 civilians in cross-border raids into Ivory Coast since July. The deaths have all been near Tai, Human Rights Watch said. "In the four cross-border attacks since June 2011, the motivation appears to have been both political vengeance and related to land conflict  issues that overlap in Ivory Coast's volatile west. Those killed or whose houses were burned predominantly belong to ethnic groups that largely voted for president Ouattara," the group said in its report. Matt Wells, West Africa researcher at Human Rights Watch, told AP that the organization hasn't confirmed details of the attack but "pro-Gbagbo militants have conducted repeated raids from Liberia into this region of Ivory Coast." "Liberian and Ivorian authorities need to quickly work together to bring to account those involved in this heinous act," he said. 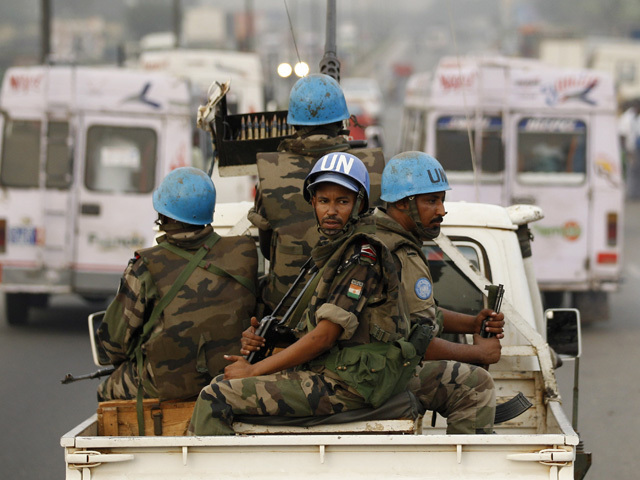 The United Nations has had a peacekeeping mission in Ivory Coast since 2004. At the end of April, the U.N. said there were about 9,400 peacekeeping troops, 200 military observers and 1,350 international police in the mission along with civilian staff. Over 40 countries are contributing military personnel. Koenders said the U.N. mission "will take all necessary measures following this grave violation of international law."